Anthropology is the study of human diversity in the broadest sense. We ask and attempt to address the most basic questions about the nature of culture, the origins of humans, and human variability. Anthropologists study the interactions between our biological heritage and our learned cultural heritages. Anthropologists are important components of management projects that deal with landscape development, human impact studies, cultural resource use, crime scene investigations, and internationalization projects. In addition, anthropologists investigate the unwritten human past that accounts for over 99% of all human existence. 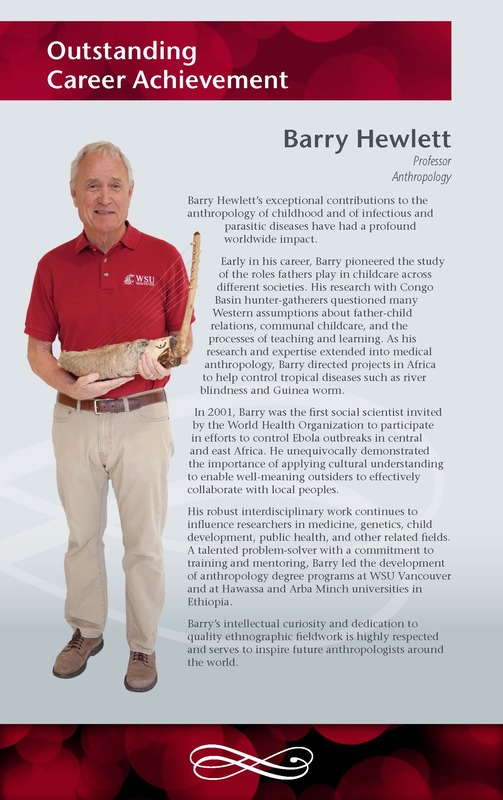 Through world class research and instruction the anthropology department at Washington State University seeks to inform the public, students, and the profession on these aspects of human diversity. Many of our students go on to make careers in one of the sub disciplines of anthropology (bioanthropology, archaeology, cultural anthropology, and linguistics). However, many of our students that did not later pursue careers in anthropology tell us that their experiences here greatly enriched their perspectives on life and learning in other fields. Our goal is to continue to pursue an understanding of, and to foster, a holistic sense of the complex human condition in all of its diversity. Colin Grier appointed to Puget Sound Partnership advisory panel for a 4 year term. Marsha Quinlan appointed Honors College Distinguished Professor for 2018-2020. Courtney Meehan named Associate Dean for Research and Graduate Education.